Design patents protect industrial design. Their effective and strategic use creates a powerful competitive advantage. Their ineffective use protects little or nothing. In this article, you will come away with an understanding of how to make effective use of design patents. 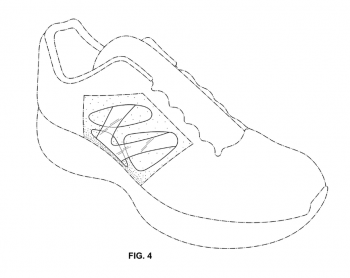 This article is part of our Five Minute Patent Boot Camp™ series. The Five Minute Patent Boot Camp™ series is a collection of short articles and videos designed to get busy executives, product managers, and decision makers up to speed on essential patent concepts. Design patents only protect form or appearance. They cannot protect function or structure. That is the job of utility patents. As an example, the iPhone’s unique design elements such as it’s continuous glass surface and distinctive shape are protected by several design patents. The iPhone’s “swipe to unlock” feature is protected by a utility patent. Let’s look at some differences between design patents and utility patents. Utility patent include legal descriptions called claims. The claims define the legal boundaries of the utility patent. Short claims with less specificity provide better protection than longer claims with more specificity. For example, a patent claim that includes a chair with a back and tapered legs has a narrower scope than a patent claim that includes just a chair with legs. A utility patent also includes a written description and drawings that gives context to the claims and helps the reader understand how to make or use the claimed invention. Design patents, on the other hand have a single claim and a short description of the figures. 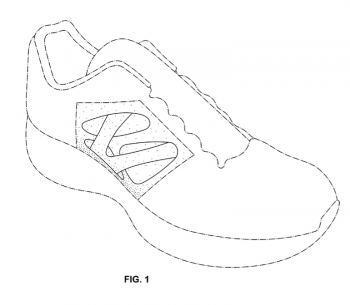 Unlike utility patents, a design patent claim is merely a formality. 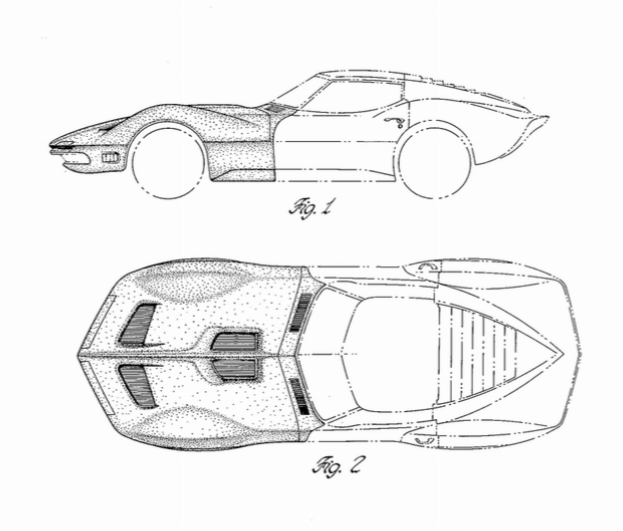 Essentially, it is the drawings that define the legal boundaries of the design patent. If you depend purely on product innovation or software to distinguish yourself from your competition, then design patents probably don’t make sense for you. However, if you depend at least in part, on innovative industrial design or product appearance to help brand your products and distinguish yourself from your competition, then you should strongly consider design patent protection. Design patents have come into the spotlight recently because of the Apple vs. Samsung litigation. The original law suits brought by Apple accused Samsung of infringing on three utility patents and four design patents. However, design patents have protected distinctive designs long before Apple and Samsung faced off. Look at the iconic Coca Cola bottle. 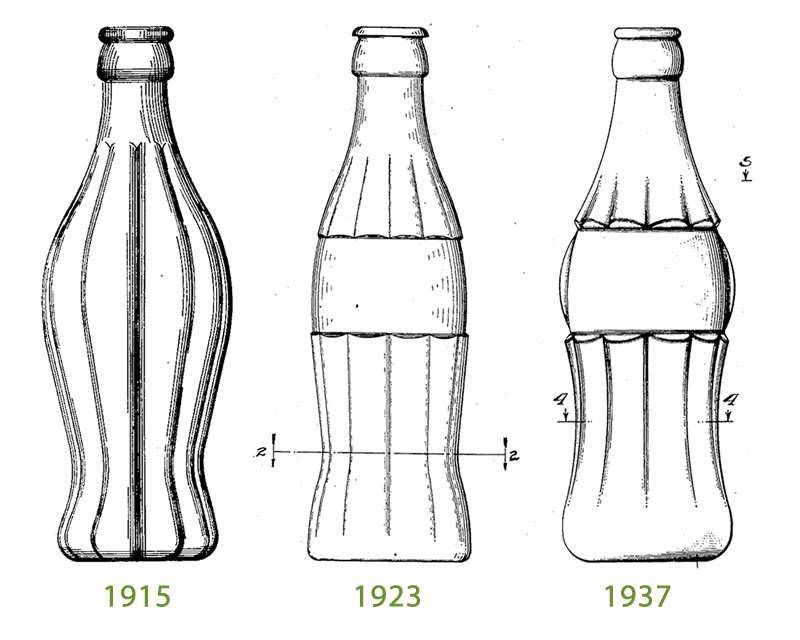 Coca Cola’s design goal was “a bottle which a person could recognize even if they felt it in the dark, and so shaped that, even if broken, a person could tell at a glance what it was.” The shape is very distinctive and helped Coca Cola distinguish itself from it’s competitors and eventually became one the most iconic shapes in the world. Today leading companies in diverse industries protect distinctive aesthetic design elements of their products with design patents. These include Samsung, Apple, Microsoft, LG, Panasonic, Nike, Ford, Toyota, Kohler, Bosch, Sony, Goodyear, Procter and Gamble, and 3M. A design patent’s duration is fifteen years from the date that the design patent is granted for applications filed on or after May 13, 2015. See the Manual of Patent Examining procedure, M.P.E.P §2701. 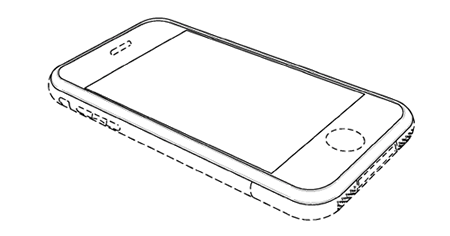 For design patents filed before May 13, 2015; the design patent duration is fourteen years. The good news is that unlike utility patents, design patents do not have maintenance fees. Each distinctive element or feature depicted in the patent drawings limits the scope of the design patent. All things being equal, drawings with fewer design elements generally make for stronger design patents than drawings with many design elements. 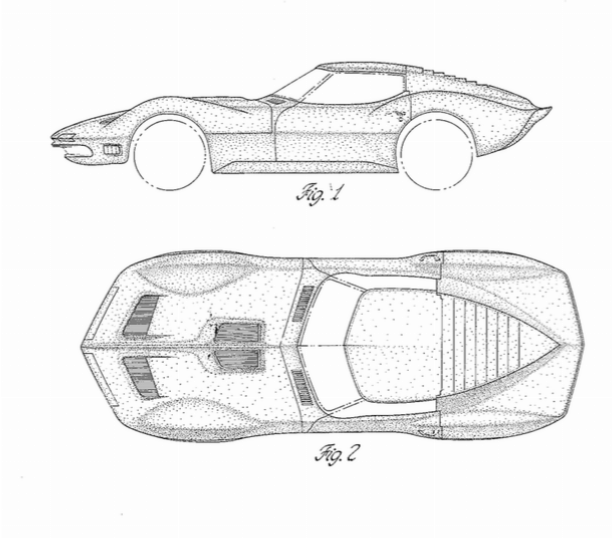 Designs that are noticeably distinctive from the norm make for stronger design patents. The more distinctive and radical the design from the norm, the more likely that an ordinary observer would not notice differences between a copy cat design the patented design. For example, a person is less likely to notice the difference between a 2008 and 2015 Toyota Prius, if the norm were a 1929 Ford model T.
The design patent filed in 1954 and issued in 1958 depicting Nathan Horwitt’s iconic watch design, originally made by Vacheron G. Constantin-LeCoultre Watches, Inc. provides an excellent example of a design that is radically different from the norm and claims few design elements. The design patent drawings claim only the crown, the watch hands, and the dot. The design is so radically different and distinctive from any other watch at the time of invention, that copy cat designs with longer watch hands, or a smaller dot, or even a different size watch crystal would still be mistook as Horwitt’s design. Because design patents protect appearance, patent protection must be dictated by a decorative or aesthetic design choices and not by function. A good example is a key. The appearance of the key’s head or end portion is often dictated by aesthetics. The key body however is dictated by function and generally would not be eligible for design patent protection. If the key body is functionally or structurally unique, it might be eligible for a utility patent. As an example, I have included a figure from U.S. Design Patent No. D618,983. 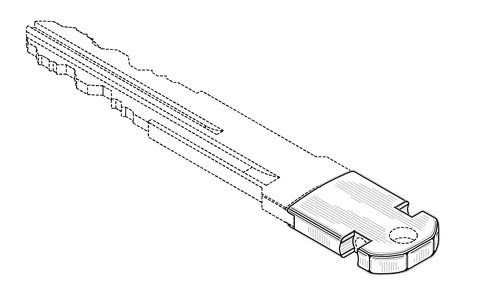 This design patent protects the appearance of the key head. The rest of the key is in dashed lines indicating that those portions are not claimed. Many approach design patents by simply slapping together illustrations of their product in its entirety and calling it a day. From what we have learned here about design patents, this not always the best approach. It may protect against direct “copy cats,” but it misses an opportunity to get broader protection of your design concept. There is a better way to approach design patent protection. Consider what visual features that set your product apart from your competition. Another way to look at this is to ask yourself, what visual features, if they appeared on your competitor’s products, would upset you the most? Once you identified the most important visual features, you are in a better position to have your patent attorney or agent draft a more effective design patent. The next decision is to decide whether a single design patent or a suite of design patents can protect those visual features. Individual design patents can protect all essential design elements, in combination, within a product, and exclude non-essential design elements. Individual design patents can include multiple drawing sets of the same design. Each drawing set, or embodiment, can protect different elements of the design. A great example of a design patent with multiple embodiments is Nike’s “Shoe Upper” design D649759. This design patent has four embodiments, each embodiment protects a combination of different weave patterns and material transparency of a the side of a shoe. A perspective drawing from two of the embodiments is shown on the right. A design patent suite can also protect different design elements of single design. For example, U.S. design patent D206063 and U.S. design patent D206062, on the right, each protect different design elements of the same car. U.S. design patent D206062 claims only the front portion of the car and is therefore broader than design patent D206063 which claims the appearance of the entire car. Choosing whether to file a single design patent with multiple embodiments, or a design patent suite, often comes down to risk vs. cost. Each design patent in a design patent suite is independent and stands on its own. If one design patent is invalidated, the others are still valid because they are independent of each other. All embodiments in a single design patent stand or fall together. if one embodiment is invalidated, then the entire design patent is invalidated. Example of a Design Patent Suite: U.S. Design Patent No. D206063 above and U.S. Design Patent No. D206062 below. Because design patent applications have a very high allowance rate, it is often assumed that a design patent search is not necessary. However, getting a design patent and implementing an effective design patent strategy are two different things. Think of your design patent drawings as defining the “property lines” of your design patent. Knowing these limits helps you understand what feature combinations are essential and which can be eliminated to create broader protection. A design patent search uncovers how distinctive your design is compared with what is already available. Design patent searches give you visibility. They provide insight. They reduce risk. This will help you make an informed business decision. Design patents protect distinct visual appearance. They can be an effective part of a business strategy that sets you apart from your competitors. The strength of a design patent is determined by: (1) the number of visual elements (less is better), and (2) how different the overall visual impression of the design is from what already exists. Effective design patent protection involves identifying what makes your product distinctive and protecting those elements. Consider a design patent search to understand the limits and possible strength of protection. Interested Protecting Your Industrial Design? Call toll-free: (877) 707-1572 anywhere in the U.S. to discuss design patents.